Despite opposition by a group which is in minority, the majority of Iranians support government’s constructive and interactive foreign policy towards the world, the President said. Iran is committed to resolving its problems with the world through negotiations, President Hassan Rouhani said on Tuesday. Speaking in a western suburb of Tehran, the president noted that Iran’s strong negotiating team would continue its step-by-step realization of the nation’s rights. Rouhani added that his administration would continue its moderate policy under the support of nation, adding that the government is duty bound to follow the guidelines of the Supreme Leader of the Islamic Revolution Ayatollah Seyyed Ali Khamenei. Criticizing the hard-line political groups in the country, he called for solidarity among Muslims as well as the Iranian nation as a precondition to resolution of socio-economic problems. The president cautioned the Muslim world and Iranians against enemies’ divisive plots which aim to spread unrest in the region. 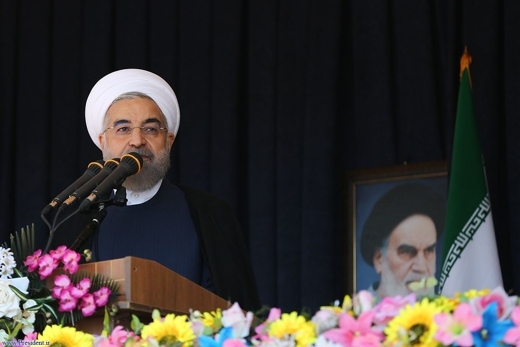 Iran wants to have peaceful coexistence with its neighbors and all countries in the world and it is committed to resolving its problems in the international community through logical talks, Rouhani added.